When Tom Ford discontinued its natural hair brushes and replaced them with synthetic ones I felt: 1) hot burning rage and 2) intense curiosity. First, why take perfectly great brushes that are do what they do well and then replace them with cheap materials for the same high prices? And then second, I got super curious if one of their best brushes, the 13 Eyeshadow Blend Brush could be improved by its conversion to synthetics. I have a bias towards natural brushes. I have a few synthetic blend and synthetic-only brushes, but the same soft, slick, and snappy texture of synthetics isn’t anything special to me compared to something like kolinsky hairs (also soft, slick and snappy). They do work well with creams and liquids, but then again, apart from fragile squirrel hair types, so do other natural hairs (for example, the original Tom Ford goat). One can be against using animal-derived products, which is an admirable moral position but then be stymied by the industrial production of plastic and petro-chemical synthetic bristles. Therefore, I try to simplify my brush life by liking what I like. I’ve been using the new synthetic Tom Ford 13 and it’s impressive in one specific way, it will blend and diffuse like there is no tomorrow. I mean, this is totally a brush that lives up to its name, but that’s not necessarily a good thing. It’s so strong that it’s easy to over blend and obliterate and gradation. Where I have pretty limited lid space real estate, blending between shades is a no go, but blending out the edges works. I need to be pretty careful not to work an area too much. 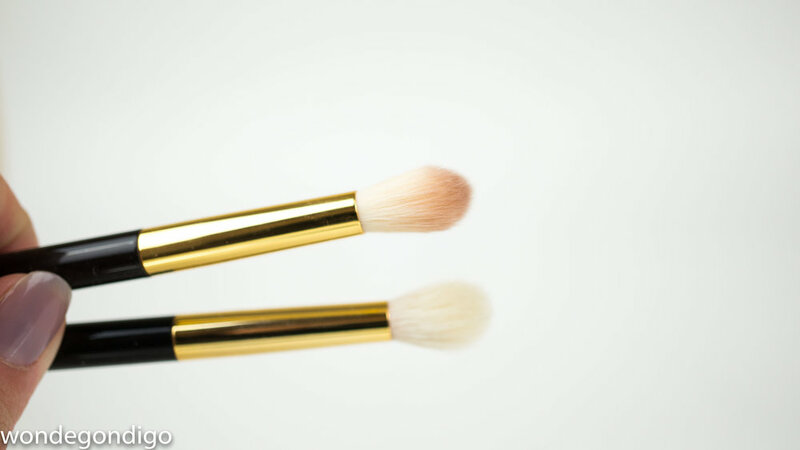 Tom Ford 13 Eyeshadow Blend Brush (Synthetic) Dirty and 13 Eyeshadow Blend Brush (Natural) Clean. In the two photos below you can see the synthetic (dirty) and natural bristle (clean) splaying out when I exert strong and light pressure on them. You can see how the natural ones have much more uneven edge from the tips of the hairs while the synthetic ones are much more uniform. In the second photo, where I am applying lighter pressure, the natural hair brush head fans out more easily. What that translates to is that the 13 synthetic keeps its tight shade more easily and has a resistant springiness to the bristles. That combined with the uniform tips makes it an über strong blender. Natural hairs have an outer cuticle structure which are like overlapping fish scales along their lengths. Those tiny ridges do an admirable job grabbing powder and I don’t seem similar performance from the smooth synthetics in picking up product. While I was going through my brushes, I realized that I’ve misplaced not other 13 natural! Pray to the god Pan it shows up again. I will gladly sacrifice my new 13 synthetic for my old 13 natural! Anyway, here’s a round up of a bunch of similar brushes. Most are dirty and require a spanking. I mean, a washing. 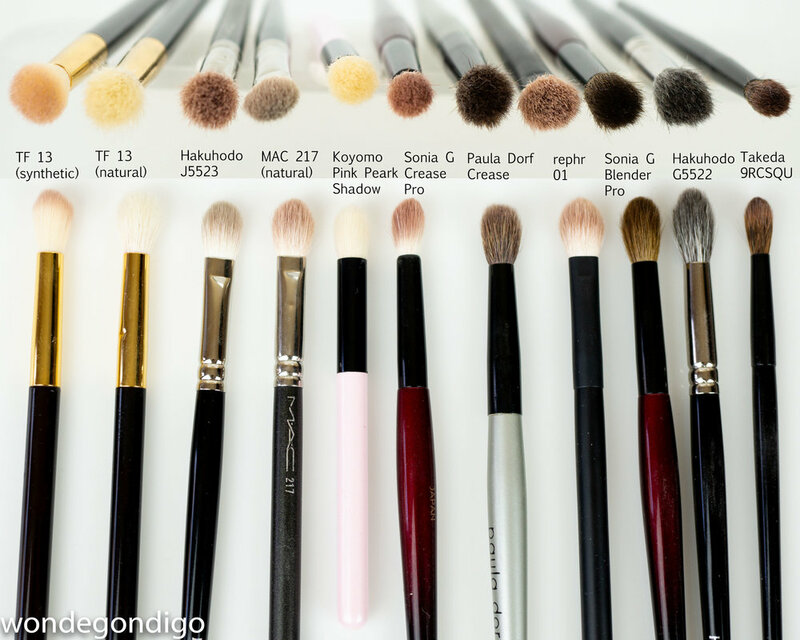 I often use crease and blending brushes interchangeably because I have a very shallow crease. A traditional crease brush is usually too large for the precise crease placement I prefer. I mispelled pearl as “peark” and I’m too lazy to fix it. 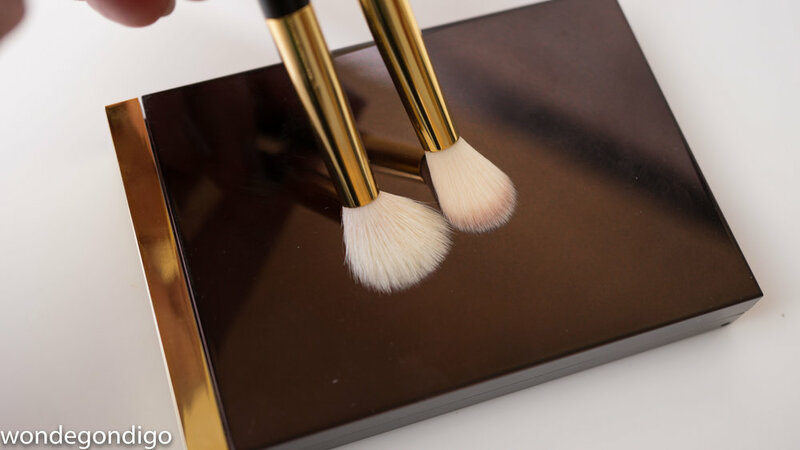 Pinched ferruled brushes, with gives a more oval shape and allows the brush to splay out, are terrific for laying down washes, base colors and overall blending. These are the J5522, MAC 217, and rephr 01. Round ferruled brushes, with denser tight bundling make wonderful blenders (without going nuclear like the synthetic 13). Thems the Sonia G Crease Pro, Koyomo and the TF 13 natural. Among the pile, which is my favorite and which my least? Least is easy, it would be a tie between the new TF 13 synthetic (nuclear!) or the Paula Dorf Sheer Crease. 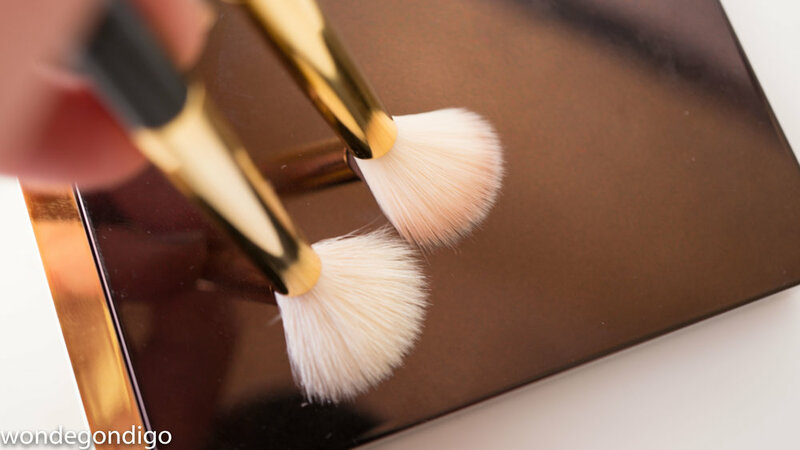 The Sheer Crease is a great brush, but over time it’s become scratchier and unpleasant to use. As for favorite, I would say any clean one does the trick. I think my overall brush collection has grown so much that I can’t keep them straight in my head. Also because these are all Kumano fude, with high quality materials, majority are great pleasure to use. What blender brush has caught your eye and what’s your favorite? Which brush do you want to send to the bin?